To Give A Smile was founded in 2005 and has uplifted and brought smiles to thousands of children and their families facing medical illnesses around the world. We have hosted over 50 fun-filled outreaches that are designed to bring a smile to children facing medical illnesses. Outreaches range from Ice Cream Socials to Game/Move Nights to our Annual Toy Drives that uplift the spirits of children. To Give A Smile has also led multiple international medical mission trips since 2009. In each location, the organization partners with teams on the ground to provide life saving treatment through our medical clinics. 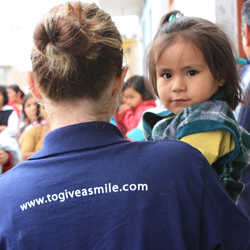 Since the launch of To Give A Smile, over 1,500 individuals have received treatment through our mission efforts. Give a child a reason to smile! Christmas in July Kicks off! To Give A Smile is a 501 (c)(3) nonprofit recognized by the IRS, and all donations to To Give A Smile are tax-deductible in accordance with IRS regulations. © 2019 To Give A Smile. All Rights Reserved.